Coordinate hit-and-runs on key structures using heroes and recalls then mass armies on enemy gates. SoG here stands for "Siege of Gondor". The map is 4v2: Gondor, Rohan, The Elves, and the Fellowship face off against Mordor and Harad. The Alliance (Gondor, Rohan, Elves, Fellowship) win if a) Sauron (goliath) and Barad-dur (greater spire) are killed at the same time. If either is killed alone, it respawns once. OR, if Frodo brings the ring (data disc) to Mt. Doom (Khaydarin Crystal inside Mordor's base). Mordor wins if Gondor loses all 4 of its special buildings: Osgiliath (Assimilator), Mt. Erech (Crashed BC), Minas Tirith (Protoss Temple) and Dol Amroth (Psi Disruptor). Each player has special buildings (Except fellowship) which, if they stay alive, spawn units on a timer. These spawns become more powerful when the player completes "castles" (usually an academy, a nexus, a hatchery, or a queen's nest) that take 5-10 minutes to complete. 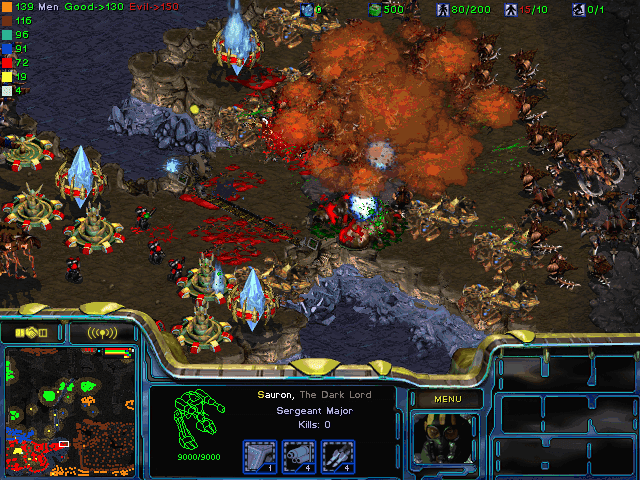 Each player also has heroes that they can use to kill enemy bases before all the castles are complete. The appeal here, once you get used to the genre, can be huge: it combines rpg, defense, strategy, and also introduces the gameplay element of "ops" or operations, where you use a hero to destroy an enemy base.